Incident Details: A 59 year old male, walking with a companion on a very hot day, succumbed to the heat, and became semi-conscious. The Team mobilised swiftly with the first vehicle being away in 3 minutes. A second vehicle followed soon after, and other Team members went direct. As the casualty was a long way from the roadhead, and the diagnosis was for possible heatstroke, they Team sought air support, and an S92 from Prestwick was scrambled to assist. 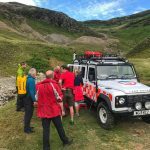 Two Team members ran the length of Langstrath to get to the scene, to find that some helpful passers by had managed to get the man into the shade of their tent, and begun to rehydrate him. 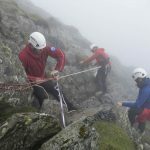 However, as he was unable to walk any distance, the helicopter continued to the scene, and airlifted him to rejoin his companion at Stonethwaite, where their transport was situated. The Team then stood down and returned to base. 15 Team members – 2 hour 30 minutes.